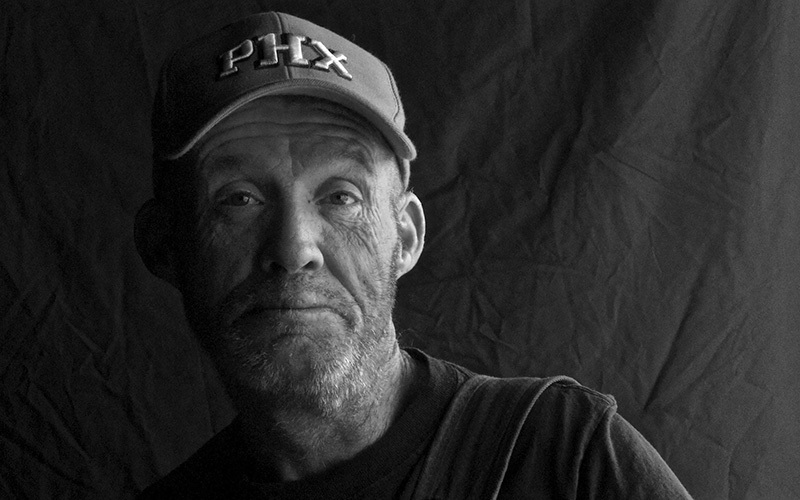 PHOENIX – Black-and-white portraits of people without homes, people who often are ignored and misunderstood, hang on a wall at André House. Each photo reveals a single moment in a singular life. Contentedness juxtaposed with melancholy. Silliness tucked beside seriousness. 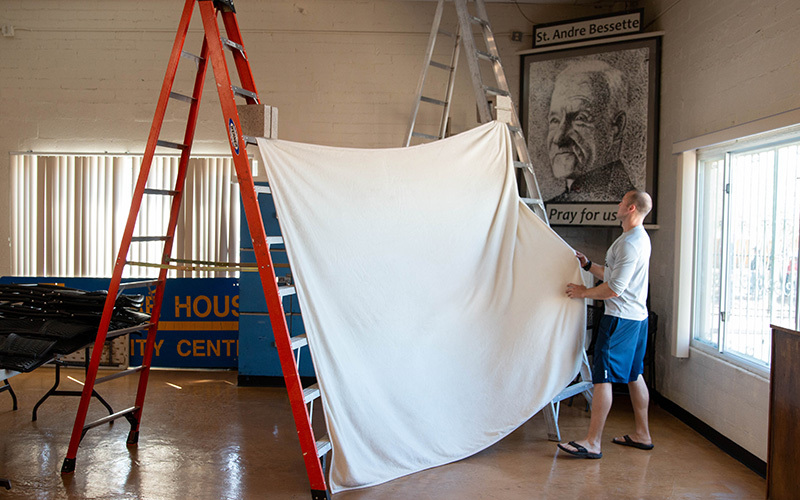 Samuel MacDonald started shooting the portraits in 2015 when he worked at André House, fitting them in among his job duties for the “house of hospitality” in downtown Phoenix, which offers laundry services, meals and other resources to people who are homeless. He has since moved on to a different career, but the people draw him back. He has learned about Terry Clark and his dog, Dirt, and Wilfredo Gonzalez, whose journey to happiness plays out in three portraits. But MacDonald said his photos have meaning beyond the images. “This is someone who is worthy of someone taking the time to say, “You are someone who is beautiful. I would like to have a picture of you,’” Samuel MacDonald said. “This is someone who is worthy of someone taking the time to say, “You are someone who is beautiful. I would like to have a picture of you,’” MacDonald said. The stigma of homelessness wears on people’s psyches, MacDonald said. 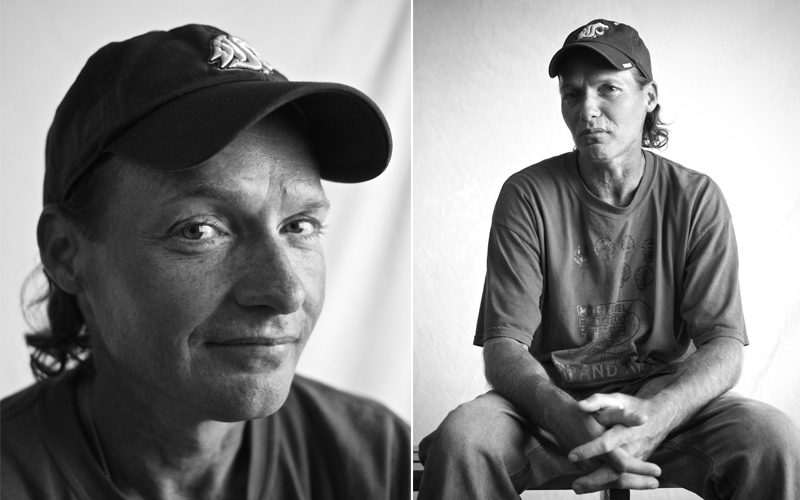 Most people sit down for formal portraits to document their school years, graduations, weddings and holidays, but people who are homeless may not have the money, the opportunity or the occasion to have their picture taken. The Photo Project, as it’s called at André House, is MacDonald’s way of documenting the basic humanity that belongs to people who may have lost everything else. The portraits idea arose from a black-and-white film photography class MacDonald took his senior year of college. 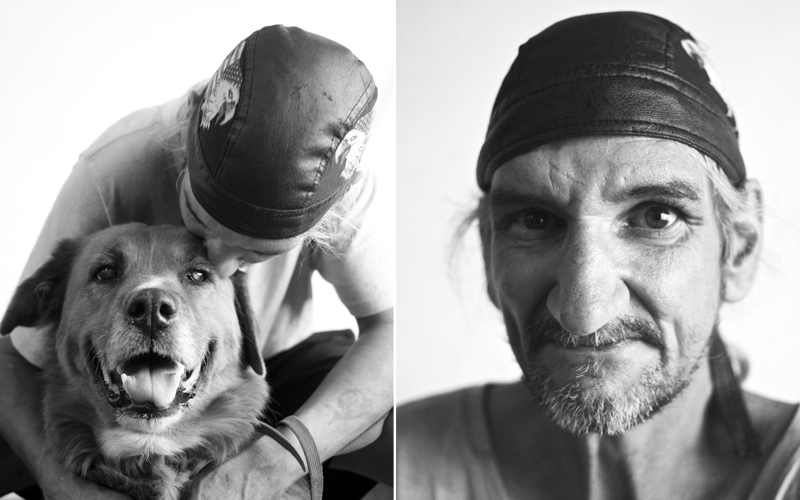 His teacher suggested he take portraits of six people experiencing homelessness and print two for his final project – one to present in class and one to give as a Christmas present to the person in the photo. “God made dirt and dirt don’t hurt. That’s why I named her Dirt, because she’d never hurt anyone,” Clark said. In the 10 years Clark has had Dirt, this is the first photo they’ve together. MacDonald, between shooting photos, inquired about Clark’s life, pulling the camera from his face to ask questions and listen to the answers. With arms stretched towards the ceiling, Clark shows MacDonald how his father reached into the air, told his family he loved them – and died. After MacDonald was done shooting photos, including headshots, Clark chose the ones he liked – all of them with Dirt. They shook hands, Clark and Dirt went on their way, and MacDonald got ready for the next shoot. Even though MacDonald no longer works at André House, he tries to visit the center every morning before going into work at the Office of the Medical Examiner of Maricopa County. He sets up the “studio” for portraits every few months. “You’ll see someone that you get to know. You love them and care for them. Then, you’ll come into work the next day and you find out they’re gone,” he said. People may leave for a number of reasons. Someone might find housing or leave the area. Some of those pictured on the wall have died. Later, pointing at a photo on the wall, MacDonald told the story of a man people at the center called Don “the Butler.” Don was a goofy man who told funny jokes and helped unload donations when he could. When MacDonald took his photo, Don told him he planned to send his copy to family living in another state. He looked at Don’s photo again. Administrators at André House recognized Gonzalez’s abilities. “He was so naturally motivated. He’s a hard worker and extremely talented mechanically and technically.  He just wanted to help and he said that a number of times,” said Jay Minich, director of finance and administration. Minich said the timing was perfect. The center was looking for someone to fill a maintenance position and Gonzalez’s experience fit the bill. 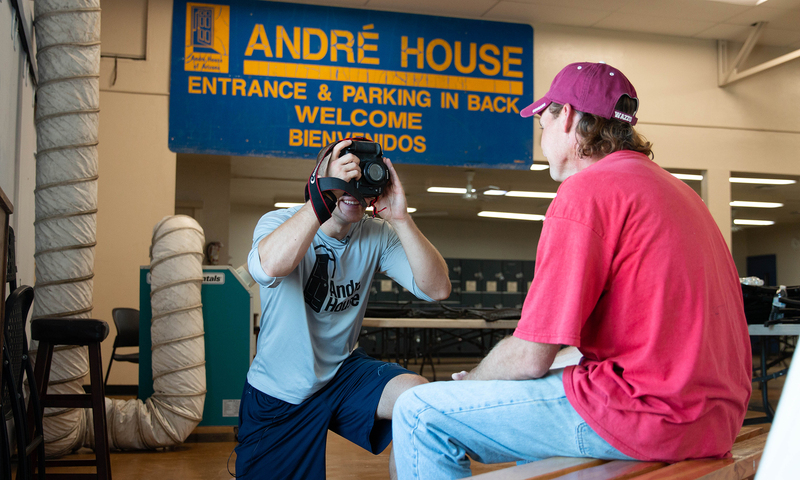 The third photo shows a grinning Tom Doyle, André House executive director, with his arm around the shoulders of a ball-cap clad, smiling Gonzalez. In July, he was hired to work full-time as a maintenance man. Minich said the photo wall, full of the faces of workers, volunteers and the people André House has helped, showcases the center’s mission.